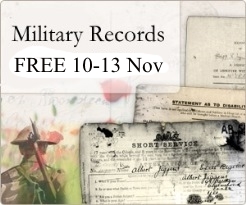 Ancestry is opening up its 'UK' Military Records collection for a long weekend of free access. Don't be put off by the UK in the name of the collection. Included are Irish, Canadian and Australian record sets. You can see the full list of 84 record collections and 18 'web' collections (the latter being indexes which link to third party databases) here, and there's a sample of some of the most useful ones below. To take advantage of the free access you need a registered account. This is free and easy to set up with just your name and an email address. Ancestry then sends you a password, and off you go! The free access period will expire on Monday 13 November at 11:59pm (UK & Irish time).